Dar Lighting Austin polished chrome finish halogen 5 light semi-flush fitting with clear & frosted glass which emits a warm glow to your room. 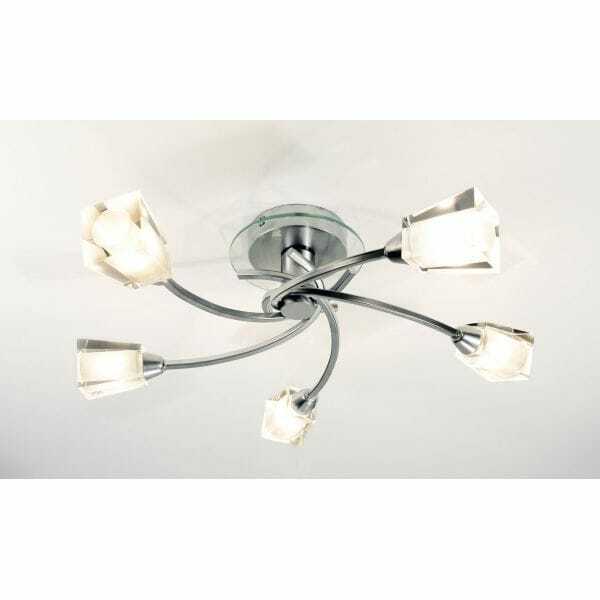 The product code for this Dar Lighting product is AUS0550, however if you prefer a small variant we have a 3 light ceiling fitting "AUS0350". We also stock matching 2 light switched wall lights "AUS0950", if you are looking to furnish a modern room these work together beautifully. You can find our matching wall lights by searching the product code in the search box above, or in our related product section below. As this Dar Lighting fitting is semi-flush, it makes it ideal for low ceiling rooms. This fitting requires 5 x 40w G9 halogen bulbs which are supplied with this fitting. For a full view of our Dar Lighting Austin range, search "Austin" in the search box above.